Waiting 4 Giovanni: Got Cast! Following an amazing run at the New Conservatory Theatre Center WAITING FOR GIOVANNI is preparing to open at The Flea Theater www.theflea.org in TriBeCa (NYC). It's being produced by the oldest Queer theatre in NY-The Other Side of Silence -TOSOS www.tososnyc.org founded by groundbreaking playwright Doric Wilson. It's been great fun to get to know the director, Mark Finley, who did a staged reading of the play a while back. He rescued me as I wandered around TriBeCa completely lost. Not having lived in NYC for 25 years and without the anchor of the Twin Towers I couldn't find my way out of a paper bag. So of course it was easy to meet in front of a McDonalds! And the board members of TOSOS, have thrown themselves into the fund raising and support for the production like angels. The idea of having to raise enough money for a full production gives me hives--and I've been a stage manager and a funder of theatre organizations so I have an idea how much this stuff costs. But they dove and are still going strong: writing press releases from Ireland while attending other arts events; spending the weekend managing the auditions; picking out visuals; working with our promotion person and poster designer. But it was soooo exciting to be present at the auditions to find the new cast. It was especially anxiety provoking since we had such an extraordinary cast in San Francisco. However it was amazing in NYC--each person who auditioned was better than the one before. Hard to believe how much talent is out there in the world. Makes me want to write faster to give actors more platforms! It was so difficult, especially when Robert Di Niro was ushered in to audition as a April Fools-type joke! He happened to be passing the studio so we all screamed with joy then spend a while calming down to finish the task at hand. Speaking of hand...he shook all of our hands and I'm never washing mine! Seemed like an auspicious sign. 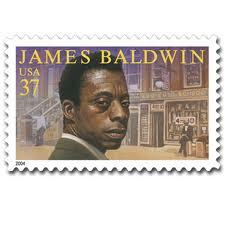 We've also planned a great party to celebrate James Baldwin's birthday after the show on August 2! I'll unveil--figuratively speaking--the cast in my next blog!